While applying to business schools in 1980, Steve Case prophetically wrote: “I firmly believe that technological advances in communications are on the verge of significantly altering our way of life…” In his personal statement, he further predicted (ten years before Congress decommissioned the ARPANET) that screens would become “information lifelines” between consumers and advertisers, resulting in new customized content for a growing “electronic society.” Ironically, the founder of AOL’s application was rejected from every business school to, which he applied. Case confesses his lack of higher education at the end of his recent book, “The Third Wave: An Entrepreneur’s Vision of the Future.” If the first wave was building the Internet, and the second was applications on top of it, the third, Case argues, is connecting everything to the Cloud. The Internet scion also suggests that the innovations leading this revolution would most likely be launched outside of the hallowed office buildings of Silicon Valley, Boston, and New York. In starting Revolution Ventures, Case set out to find disruptive technologies in America’s heartland often ignored by typical venture investors. One of the most inspiring activities of Revolution is its “Rise of The Rest” bus tour that has traversed 10,000 miles, 38 cities, since 2014 to fund local startups across the country. This past summer Case’s caravan completed its 7th road trip to such burgeoning hubs as Dallas, TX, Memphis, TN, Birmingham, AL, Chattanooga, TN, and Louisville, KY.
Palmer Luckey could be a poster child for Case’s Third Wave. The outspoken twenty-something engineer co-founded Oculus with his friends from Irvine, California. Luckey’s successful crowd-funding campaign caught the eye of Mark Zuckerberg who later acquired the entity for more than $2 billion. After being ousted from Facebook for clashing with Zuckerberg, Luckey set out to build his next startup with funding from Revolution Ventures and others. Anduril Industries is a multi-sensory artificial intelligence platform that integrates computer vision, drones and deep learning software to monitor terrestrial assets on the ground. The company is already working with the Department of Homeland Security (DHS) in securing the Southern Border with a “virtual wall” of cameras which will most likely catch the first glimpses of the caravan of Honduran asylum seekers approaching the United States later this month. According to a June Wired article, the year-old startup is already building “32-foot towers packed with radar, communications antennae, and a laser-­enhanced camera—the first implementation of a system Anduril is calling Lattice. It can detect and identify motion within about a 2-mile radius.” All the information is conveyed to border officials via virtual reality headsets and actionable data alerts. However, Luckey is not without controversy as he has publicly donated to alt-right causes, Donald Trump’s inaugural committee, and even Ted Cruz who is currently running a very contested campaign to keep his Senate seat. In addition to Revolution Ventures, Anduril’s lead investor is Founders Fund – a firm headed by outspoken Trump supporter Peter Thiel. It could be this reason why such a young company has been trusted with contracts from the DHS over more established defensive contractors like Lockheed Martin and Israel’s Elbit Systems. Melissa Ho of California’s DHS office insists that Anduril offers a more affordable package with comparable results to existing players, “They said they could provide broader border security for a lower cost. We were intrigued by that.” Furthermore, it has been reported by the “US Customs and Border Protection, in a 10-week period, Lattice’s test in Texas helped customs agents catch 55 unauthorized border crossers, a notable figure for a system still in development. If Luckey has his way, the border wall of the future will be Anduril’s.” This view was further endorsed by Congressman Willian Hurd of Texas who introduced the Secure Miles with All Resources and Technology (SMART) Act, which would direct DHS to deploy technologies for “situational awareness and operational control of the border.” Hurd, a former CIA Agent, declares, “Nobody is disagreeing with the smart wall. A concrete structure 30 feet high that takes four hours to penetrate costs $24.5 million a mile. A smart wall, a system like what Anduril is proposing, is about a half a million a mile.” Politics aside, the economics of innovations like Luckey’s are turning government contractors on their heads in ushering in a new era of streamlined technology proposals. Anduril is one of the thousands of new startups being launched outside of traditional venture hubs. 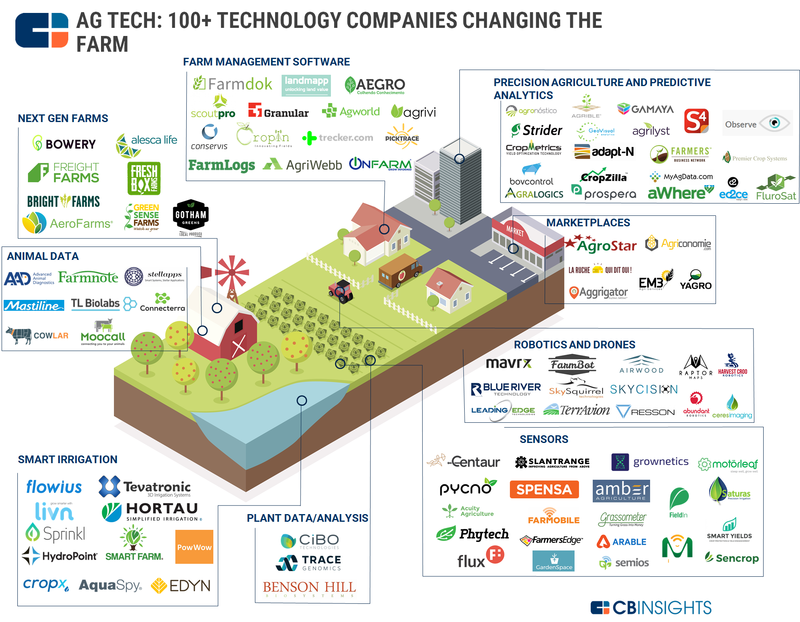 By example, one of the fastest growing sectors for robotics and automation is in agriculture. Currently, there is an autonomous tractor race to steal market sharee from Deere and Toro, two notable upstarts include Harvest Croo of Florida and Rowbot of Minnesota. According to CB Insights there are about twenty other early stage endeavors in this sector, most located outside of Silicon Valley, New York and Boston. One rising star that continues to impress farm cooperatives around the world is a small Philadelphia concern called Augean Robotics (AGR). AGR is mechanizing a two thousand-year-old farm tool, the wheelbarrow. According to its founder Charlie Andersen, “People spend as much as 20%-30% of their time picking in the field actually walking up and down these picked rows.” In order to make farming more efficient and less back-bending, robots will be used to augment human workers. Anderson’s robot, BURRO, is an autonomous roving wheelbarrow that follows farmhands as they harvest crops. “Our idea is that you’d actually turn on the machine at the beginning of the day, walk it up and down a couple of rows in a looped path to train it to a path, and then have it re-run that path autonomously throughout the day, functioning as a virtual conveyor belt,” boasts Anderson. The company is currently in discussions with berry growers to begin automating their yields. Case’s Third Wave vision is not limited to agriculture or defense-related startups but spans the gamut of inventions that will eventually affect every aspect of our lives with the same pervasiveness as the Internet. Today, many Fortune 500 corporations are following Case’s lead by investing in regional pockets of entrepreneurs. WeWork recently bolstered its WeWork Labs program, which first premiered in New York City in 2011, on a global scale with the goal of empowering new generations of talent. According to Roee Adler, Global Head of WeWork Labs, “The impact of Labs is to be seen in a 10- to 20-year horizon and not something we are looking to monetize in two, three or even five years.” Adler’s vision is more than just renting desks at discounted rates, it is about enabling self-starters to fulfill their dreams to become catalysts for change with the same veracity that the rejected business school applicant foretold close to forty years ago.